Happy Thursday & Happy August! Can you believe how fast this summer has flown by!? August is a pretty exciting month for me as it's my birthday month & we go back to school so I get to see all my little first graders soon! 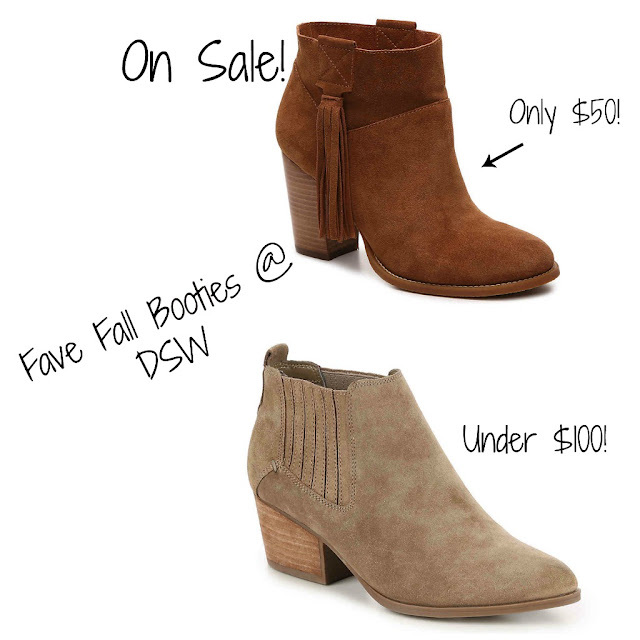 I wanted to quickly share with you two of my favorite pairs of booties I own that are still available at DSW! * On Monday I headed down to the waterfront to enjoy the beautiful weather with my friend Annaliese from Southern Belle in Training . 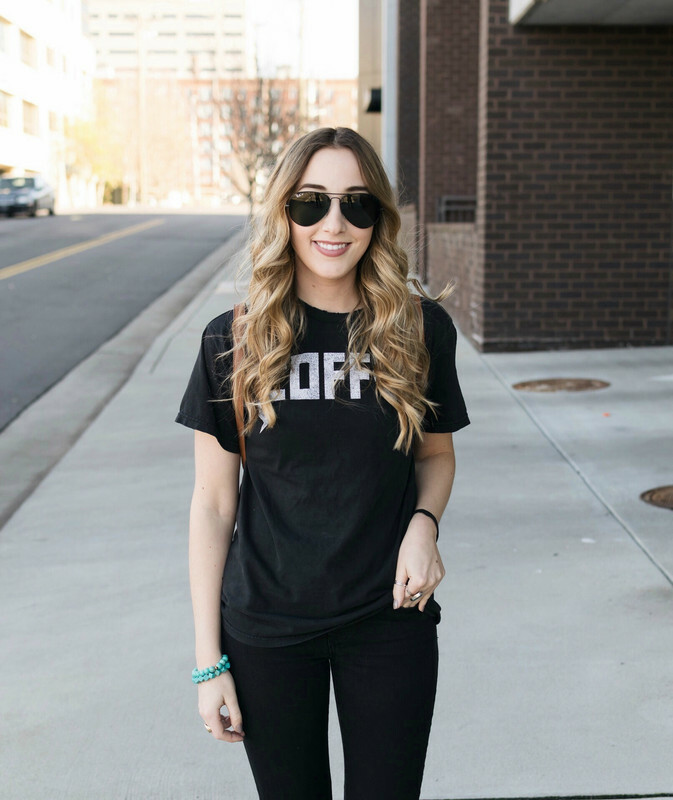 I had the best time just chatting about girly things, I love to just hang out and relax whenever I get the chance! * On Tuesday Kyle & I went to Splash for dinner which is a restaurant down on the lake in Burlington. On Tuesdays, they have 'Taco Tuesday' from 5-7 which means $3 tacos! Such a great deal! I LOVE their fish tacos- they are so good. I also love that it's right on the dock on the water- such a good atmosphere. * On Wednesday morning I got my hair done. Savannah from Full Spectrum Salon has been doing my hair for about 3 years now and I promise you she is the BEST. If you're looking for a great colorist she is your girl. Other stylists use to leave me disappointed with my hair looking brassy but I'm happy to report my hair has zero brass and is the prettiest shades of blonde & brown! * Thursday and Friday are going to be spent doing laundry & cleaning my house, YUCK! * So far my weekend is looking like a lot of Rest & Relaxation. Kyle & I have been pretty busy lately so it will be nice to spend the weekend hanging around our house. Hopefully, it will be nice out so we can hang up the cutest new patio lights I picked up! * I need to start packing for our trip to Maine- We leave next week so I need to make sure we have everything we will need. My family has been going to York, Maine since I was 8 so it's such a fun time for all of us to spend together. * I must clean my car....Does anyone have any tips on keeping their car clean & organized!? Let a girl know!! I had a lot of fun on Monday!! :-) It's so exciting that so soon you'll have your own classroom ahh!! Taupe booties are my go-to for Fall! Those tacos look SO yummy! Looks like a great week! I can't get enough of fish tacos! That's one of my favorite meals to cook at home. Your hair looks great!!! I have NO plans for the weekend which I'm pretty excited about. Hope yours is a good one. Sounds like you had a great week! Those tacos look delicious! $3 tacos?! I might have to take a trip just for those! I went to school in Burlington and absolutely loved the town. Definitely need to plan a trip soon. Those tacos look SO good!! Making me crave some! A trip to Maine sounds like so much fun! I haven't been in like 15 years - I'd love to plan a trip back too! Ah! Those tacos look ah-may-zing! i love those booties! I'm excited for some R&R this weekend too! Ugh i need to clean my house too! At least your hair looks good! Those tacos look amazing! I may need to find some locally here in Nashville this weekend! #cravings!